It's been a long time but I'm still Chrysler Sailing dreaming. I've been working, and working and working and in my spare time I've been working some more. 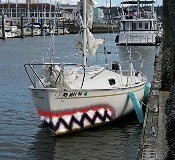 My Boat is still sitting on it's tailor waiting to go swimming in Puget Sound Again. I opened it up last month and found 6 very active Wasps nests and they were not pleased to see me. I closed it all back up and decided I would wait till the weather cooled down and clean the little Pirates out and then put my boat back in order. Frankly the worst it's ever looked under my ownership. Well maybe out sailing again in late Winter early Spring. Well back to work. It's good to have a job after not having one for a couple years. A small container of apple cider vinegar is supposed to be a very effective repellent. Spraying it on the openings creates a barrier and they will be gone within a day. If you don't mind dusting (Sevin-5), it will kill them over the course of a week. Wear a mask. I have taken the Rambo approach with a can of Raid wasp killer and shop vac with an extension too. What you don't kill, you draw into the vac. It is really funny to ear the thump, thump thump of the wasps as they hit the inside of the dust collector. You are done in 20 minutes. Our boat was left fallow for 8 years by the previous owner. We also had a wasp nest created under our entry stairs that had to be eradicated. I have tried all of the remedies. Regardless, be safe - wear lots of protective clothing and netting around your face and neck. That sounds very promising. I will try it on Sunday after work. Thanks! Hi Alan ! Hey, right there with you on the boat status - EE was a mess after someone left hatch open at yard and she collected quite a lot of water that sat all winter - gutted (again) and shooting for spring myself. We have these bright orange wasps that are highly aggressive down here. You can be on the riding mower and they will come after you from a nest 15 feet away under the house eaves. So I have a zero tolerence policy. Knockdown spray anytime I see any !! Plus the redhead is allergic to stings..BUT the vacuum sure sounds fun ! Hi Alan...good to see you posting here again...I'm glad that you have the job but sad that you aren't able to get out and sail. Glad to here from you! When you are ready, let me know! I can assist in moving your boat! JUst need to get time on the schedule! Ah, I worked Saturday and Sunday again so the Wasps are still in residence. As for relaunching Scott, it's on my mind daily. I will have to re-do all new rigging on the exterior ropes. It's possible some will be okay but I don't sail on just okay anymore. Do it right or stay in port till you can do it right. Safety first. Also it is so dirty right now I won't even tell anyone it is a Chrysler for fear of besmirching the brand. "No, no, that's not a Chrysler. That is a Bill and Teds Most Excellent sailing craft. I wish I owned a Chrysler!" Well something to that effect anyway. Good to hear from you again! Don't post as often but try an read to see what all is up. Hope you get back on the water in the spring! Pam an I have 3 bee hives now an I don't like the wasp/hornet clan at all... no tolerance for them either. Bad for the honeybees! Just started painting the inside of our project boat an then can start putting gear back on. We hope to be splashing next year! Capt Scott has told me of you, another Chrysler sailor in the Area. As to the Rambo Method of Wasp Warfare, I can attest to the exciting aspect of the hunt. When I built my shop (Capt Scott has seen it), I did not immedeately install the outside lights, leaving the wiring hanging out a few inches through 1" holes where the connection boxes would go. Within a few weeks, yellow jackets moved in and created a nest of about 2000-3000 of the little nasties. With the interior finished with sheetrocck, there was no way to effectively get at them with Raid, which I sprayed into the hole in copious quantities. It had little effect on the population and the fight became decidedly one-sided in their favor. Not to be defeated, I got my trusty Sears 16 gallon vac, with the two extensions, and stuck the end up to the nest opening. At first, only the unfortunates who arrived as in-comers became victims of the gaping maw of the giant sucking wind tunnel. Eventually, the alarm was sounded, and dozens soon attempted to launch a sortie to drive off the attacker, only to meet their fates as they let go of the edge of the plywood siding. I could clearly hear the little voices of the doomed as they yelled, "EEEEeeeeee...!" Within a few minutes, the counter assault abruptly stopped. No more of the little kamikazies came forth. The word must have spread within the Borg. A few continued to arrive, only to be sucked into the Deadly Vortex of The Sears-o-Cutor as I would send a generous blast of raid down the spout at intervals. There was alot of very active and loud noises coming from within the wall, and I could tell the entire colony was locked in a serious discussion of what to do. Knowing there were at least a million angry little bastids in there, all hating me at once, I decided that a more direct approach would get them to give battle. I propped the vac hose up against the wall, just under the hole, and went into the shop to fetch a length of wood to use as a prod to pound on the wall, hoping to get the little buggers to come out. I found a junior league aluminum bat and went back out to beging the challenge. I took up the vac hose in one hand, holding it just to the side of the hole, and with the other hand, I began to tap the wall. Nothing. I then began to pound a bit harder, really shocking the panel to maybe dislodge them and piss them off enough to get them to come out. They came pouring out that hole in platoons, then companies, then battalions. Within a few seconds, I was sort of thinking that maybe this was not a good idea. So far, the vac was sucking down all the bugs that came out, but soon as the flow reached the division level, a few got by and were actively seeking a target. Luckily, I was stock still, and they tried to attack the end of the hose extension, getting sucked into the tube. But some did not, and they were slowly figuring out that I was attached to the hose somehow. Perhaps I was emitting fear pheromones. Did I say that this is where things went wrong? Breaking my concentration, I flinched, or turned or something to acknowledge him, and , when I turned back to see what was going on, I was looking straight at a lone tiny warrior coming straight at my face. Instinctively, I swung my right hand at the determined antagonist, forgetting that it held the Junior League Whopper. Of course, I missed the little ninja, but he did not miss me. I'm not sure what hit me first, the sting or the bat, but either way, I dropped the hose and ran, whereupon the remaining attackers were now unfettered. My neighbor stopped the heckling and the last thing he uttered as he fled for his life was something I can't write here, as the swarm went after him, not me. 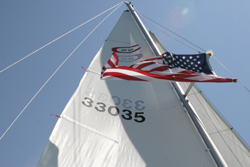 Forever: '83 Grumman 17, gunter rigged with jib and trimaran outriggers. Funny read but scary at the same time! Get a 7up or Sprite in a clear 2 liter bottle, and empty about 2/3's out, pull the labels off, then cut a small hole in the dome part. Hang near the nest and they'll be attracted to the sugar liquid and go in after it, but since the bottle and liquid is clear they have trouble finding the hole and will eventually fall in the liquid and die..
Works on our Gulf Coast critters, not sure about in the PNW or other regions ! This remedy is strictly for non-smokers. Wasps, hornets (and rattlers) don't like gasoline fumes. Toss three or four ounces of gasoline (do not light the gas) into the entrance hole they are using. Depart the area! They will leave and not return. This is best done after dark when they are all in the nest. I have cleared vehicles (and small outbuildings) of wasps by disconnecting the battery ground cable and placing a tin can of gasoline inside leaving a window cracked open. Wasps gone the next morning. WD-40 is a good wasp spray in a pinch. Had I known any of these remedies, I would have saved myself the grapefruit on my forehead. The loud "BINK" was audible for miles. EE, I've used the 2L bottle trick with great success. I make mine a little differently. ...and every word imperical truth. I have always hung a piece of breakfast ham from a tree branch when camping to lure the Great Cascade Mountain Yellow Jacket away from my repast. Perhaps a slice of that in the bottle would make a suitable bait. Sugary liquid won't spoil like the ham...and many people who have been stung in the lip will attest to how they like soda and beer cans. astrorad wrote: Sugary liquid won't spoil like the ham...and many people who have been stung in the lip will attest to how they like soda and beer cans. Every time I hang up a slice of ham, it disappears in about two hours. The little thugs are relentless and varacious. They never fight over the meat, though. They just eat their fill and another takes its place. No time to rot. It sure does a good job of keeping them away from my cooking. It's just a variation of hanging a fish up.